Bumper crops of large yellow quince can be expected from this variety. Vranja quince have excellent flavour and fragrance. Often used to enhance apple pies, quince can also be used in jams, jellies and marmalades. Soft pink flowers in April and large rounded leaves with drooping branches and good autumn yellow colour make this a very attractive garden tree. 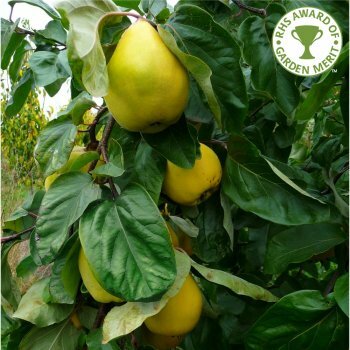 The RHS has recognised this Quince variety with the Award of Garden Merit. The full latin name of this popular variety is Cydonia oblonga Vranja Nenadovic! A bit of a tongue twister so it's commonly just called Vranja but we know some customers like to check the full nomenclature. *This is an indication of the un-pruned height of this variety of quince tree on the different rootstocks in 10 years. Variations on these heights will occur when different factors are introduced such as planting position, pruning, geography etc. Our pot grown Vranja Quince trees can be planted at any time of the year, whereas bare root quince trees need to be planted between November and March. Quince trees should be spaced according to their rootstock, for example a Quince A (semi-vigorous) rootstock will require approx. 3 metres between trees, whereas a Quince C (dwarf) rootstock will require approx. 2 metres between trees. Prepare the site by removing weeds and grass within a metre of your desired planting hole then dig a square hole slightly deeper than your root mass and 3x as wide. Sprinkle root grow in the hole to help your tree establish. Gently loosen the roots and place into the planting hole. Using 50% of the original soil and 50% compost , fill in the hole and firm around gently. Make sure not to bank the soil up around the collar of the tree as this can cause problems. Use a stake and tie to anchor the roots, allowing it to establish more easily. If you’re planting Vranja Quince in spring or summer, water well and regularly for the first few months and increase watering if there are extended periods of hot or dry weather. If planting in autumn, you may only need to water your tree a little. Once you see your fruits begin to swell, water again. It is important to prune your quince tree for the first few years after planting to ensure a healthy, goblet-like shape. Your tree should have one central leader and several side shoots. Straight after planting, remove the lowest laterals and prune the rest back to about 10-15cm in length. Carry out this type of formative pruning in early spring whilst your tree is still dormant. In the following years, remove any shoots growing out of the trunk to maintain a clear stem. Also remove any crossing, diseased or damaged branches. If your tree is looking overcrowded, remove some of the larger branches to open up the canopy. Carry out this type of pruning between November and March.